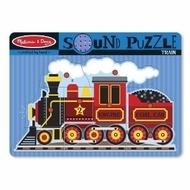 Make their puzzle come alive with the Train Sound Puzzle from Melissa and Doug. Whoo whoo says the old-fashioned steam engine when all nine puzzle pieces are placed in the board. Your child will improve with matching and listening skills while doing this wooden puzzle with its matching picture under the pieces. AAA batteries are not included.